Pasta al burro e parmigiano. Photo by Simona Carini. I open my eyes, smell onion cooking in olive oil and immediately know two things: I am awake and it is Sunday morning. It is the day and time when my mother makes the tomato and meat sauce that she will then use to season pasta for several days. I know this sounds like a great plan — especially if I add that the tomato component of the sauce is not store-bought, but home-made by my mother — and therefore it sounds like a delightful awakening. However, I am a child and would rather smell something sweet, maybe baked, something that would motivate me to get up and rush to the kitchen to eat breakfast. Instead, the combination of onion and meat strongly suggests lunchtime. I grew up on a traditional Italian diet of pasta eaten at the beginning of every lunch (primo piatto). For the Sunday lunch my mother would make fresh pasta all’uovo (egg pasta), usually fettuccine, rigorously by hand. In truth, my mother’s pasta is excellent and a bowl of her fettuccine with freshly-made tomato and meat sauce is a pleasure to savor. Starting on Monday, we would have dried pasta of different shapes with the tomato and meat sauce that came into existence on Sunday morning. I looked forward to the end of the week, when, that sauce completely consumed, we might have pastaal burro e parmigiano (with butter and parmigiano): I looked forward to departures from the routine. I think that my beloved pasta al burro e parmigiano is especially good with spaghetti, or maybe that is just the kind of pasta I loved best as a child. Eating short pasta, which requires simple spearing with the fork, is not as exciting as selecting the right amount of spaghetti and rolling it with dexterous movements around the fork, then bringing the whole tight package, without dangling long strands, to your mouth. I actually don’t have any memory of learning to eat spaghetti with a fork, so I have a feeling that it happened very early in my life. I now look at pasta al burro e parmigiano as comfort food, something you can make easily and quickly that will cheer up your taste buds and your spirit. From talking to people, I know that a soft spot for this kind of pasta is common in Italy. I am actually not a big consumer of butter, having grown up in olive oil country and in a household where butter was not used very often, but I have always found the combination of sweet butter melted by the heat of just cooked pasta and freshly-grated parmigiano to be an irresistible delight. Speaking of freshly-grated parmigiano, making it — i.e., grating parmigiano for the upcoming dish of pasta — was a task sometimes assigned to me, and one I loved to perform. A fringe benefit of cheese grating duty was the ability to sneak a small piece of parmigiano, my favorite cheese. Then, for some reason, I have always been fascinated by this turning of a solid mass of hard cheese into a mound of small particles that provide an unmistakable flavor — rich, sweet and nutty — to whatever they are added. The hand-powered cheese graters I remember from my childhood all had a container underneath the grating surface, which ensured a neat operation. Until recently, I have used my food processor fitted with the 2 millimeter shredder disc to achieve the desired effect. During my most recent visit to Italy, however, I saw a colorful grater and brought it back as a prized souvenir. Instead of a grating surface it has a grating cylinder turned by a handle. The grated cheese is collected in a small bowl that functions as the base of the appliance. It is easy to use and to maintain, and does a nice job. I love it! But I should not lose sight of why I am talking about this, which is that I recommend using freshly-grated parmigiano (obtained using the grating method of choice) for the pasta whose preparation I am about to describe in detail. And freshly-grated parmigiano tastes better if the ungrated piece of parmigiano is stored well. My suggestion is to buy a freshly packaged piece of parmigiano. The size of the piece depends on your consumption rate. I purchase a small wedge at a time and purchase it often. If the piece is not wrapped in cheese paper, remove it from the plastic, wrap it in wax or parchment paper, then plastic, once at home. Store it in the cheese compartment in the fridge, then grate it on demand — and allow yourself a small morsel whenever you need an energy and mood booster. And now, the featured recipe. I will give directions for making pasta al burro e parmigiano for two, but you can easily multiply or divide the quantities as needed. Bring a pot of water to a rolling boil, add salt to taste and toss in it 1/3 pound of spaghetti or other pasta shape, according to your preference. While the pasta is cooking, place one tablespoon of good quality unsalted butter into each of two bowls, cut into 3-4 pieces. Also, grate an ounce of parmigiano (using my grater I get 1/3 cup). 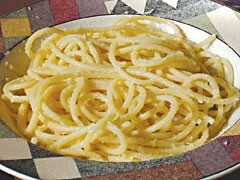 Cook the pasta until firm to the bite (al dente), drain it, leaving a little water clinging to it, and divide it equally into the two bowls with the butter. Start stirring immediately, so that the heat from the pasta melts the butter, and at the same time sprinkle the grated parmigiano on it. Keep stirring until butter and cheese are evenly distributed. Serve and eat immediately, as the dish is at its best when hot. Followed by a mixed green salad it makes a nice meal. As a child, once my mother poured the pasta into my bowl, I would stir it while she added the amount of parmigiano she deemed appropriate. (I always asked for an extra sprinkle.) It was a little participatory ritual that gave me time to smell and admire the beloved dish before consuming it. After the pasta has been slowly savored and merrily swallowed, some butter-coated parmigiano remains on the surface of the bowl. At an early age, I was taught the concluding action called fare la scarpetta, i.e., using a small piece of bread to gather the leftover sauce and bring it to my mouth. It is an intimate gesture, confined to the home dining table and not acceptable in case of a formal meal. It was passed on to me as a tradition that shows appreciation of, and respect for, the food just eaten. I am not sure I can find more precise words to explain why this simple, three-ingredient dish is so good to deserve an honor spot in my gustatory hit parade. The best thing I can do is invite you to try it. To me pasta al burro e parmigiano indicates that there is perfection in simple combinations of flavors and that the meaning a dish acquires is more than can be explained by the simple sum of its components. Bring a pot of water to a boil, add salt and cook the pasta al dente. In the meantime, put 1 tablespoon of butter in each of two bowls, cut into 3-4 pieces. Drain the pasta, leaving a little water clinging to it, and pour half into each bowl. Immediately start stirring, so the heat from the pasta melts the butter and at the same time sprinkle the grated parmigiano, again dividing it equally between the two bowls. Keep stirring until butter and cheese are evenly distributed.